Brisbane Soloist 469 is an experienced soloist who utilises an acoustic guitar, his dynamic vocals and a unique custom made stomp/resonator box to combine the old with the new in the ever-popular unplugged tradition. 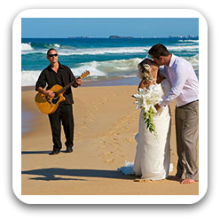 With a huge repertoire of songs for all tastes, no matter what the occasion, from light background acoustic guitar and soft soothing vocals, to high-energy party rock, this experienced musician caters for all dynamics. Having spent a number of years playing to audiences in Cairns, he based himself in Brisbane in 2000 and has never looked back. A keen traveller, he has since successfully played over One Thousand Three hundred shows engaging crowds from Coffs Harbour to Bundaberg, enjoying success throughout South East Queensland. Choose from a list or make a request. He enjoys learning new (or old) songs. The repertoire is based on the feedback that he has received over the years so there will always be something for everyone. Breakfast At Tiffanies – Deep Blue S.
We had a great day. This was our first function with live music and even though the crowd was not huge, everybody enjoyed themselves immensely. We had nothing but positive feedback about our event, venue, food and the soloist. His live music just topped off a great day. Thank you. I booked him for my wife’s’ fortieth birthday. He has a great voice and a huge range of songs that she loved. We were all very happy. We booked him for our annual Christmas Party. He was so easy and professional to deal with. His voice was amazing and everyone enjoyed his song selection. 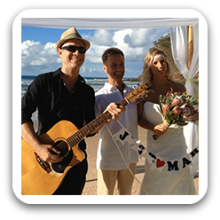 We are so glad that we hired him because he really helped with the ambience on the day.